Those that read my pieces last season, will know that non-physical attendance at games, doesn’t prevent me from writing a little piece, such is the use that can be made of Sky and BT, especially when we play away. So here are my thoughts based on not watching a single pre-season game, nor any attendance at training sessions! Why not go to pre-season games? Well, that’s the crux of my piece. I love Everton, of course, but pre-season usually involves a lot of travel (bear in mind, a ‘home game’ for me involves a 220 mile round trip to Goodison) to exotic places like Wrexham, Paderborn (no, I didn’t either, but google maps is a wonderful app) or Rhyl. That’s the cost thing, and then is it worth it? If we’d bought the entire Barcelona midfield in the transfer window, then I might want an early look at them wandering around the pitch, misplacing a pass or two, but rarely getting much of a sweat on. But we didn’t. More on that later. Pre-season for me is about game time on the pitch, about getting the fitness levels right, and being prepared for the game that [this season] really matters, on 16th August. Do we want to win? Of course, show me an Evertonian that doesn’t want to win every game, and I’ll show you a pig that flies. Does it matter if we don’t? In my mind, no it doesn’t. You don’t get 3 points by winning a pre-season game. Who remembers where we finished last season? Almost everyone will say 5th. Who remembers the results of every pre-season game last year? Well, I doubt you’d get more than a dozen correct responses. But to read some of the comments on twitter, you’d think we were already in a relegation battle. And many of these were the same people that said we’d be top 4 when we signed a player in Lukaku who actually played for us last year. Which brings me to the absence of the Barcelona midfield in our squad this year. As I write, Atsu is yet to join us, so that means we’ve got exactly the same squad as last year, minus Deulofeu, plus Besic. In other words, net no change. And in terms of quality, slightly better, but not out wide! Every pre-season needs to be about improving your squad, and sometimes, as I suspect this year, that can be done from within. Expect the likes of Browning, Garbutt, Long and McAleny to name but 4 to be a bigger part of our playing squad this year. And of course, Gibson, Kone and Oviedo will get off their sick beds and boost the squad once more. But we know we’ll get our fair share of injuries, so net we won’t be better off. 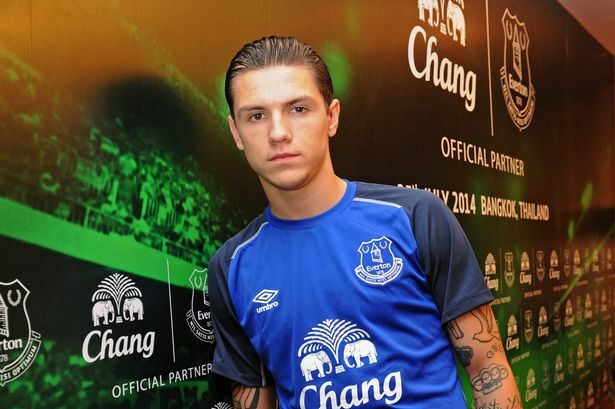 As it stands, we haven’t really improved the squad in quantity, let alone quality, however much we might like Besic’s steely eyes, and however much we’ve done brilliant things by tying young players down to long term contracts. All of that is amazing, fantastic, and forward thinking. But it looks like we need a back up or two for Rom and the wide areas. Some might add a defender or two given the pre-season games, but see above re reading too much in to that. We are going to do well this year, I know we will, but I want it to be from August to May (inclusive!) and not run out of steam by March. We need to buy or loan some quality, and if it ain’t the Barca midfield, then we need to find a few more from somewhere else!